Unless you are doing business on another planet, you surely have heard the term Cloud Computing, Cloud ERP, Cloud Accounting. You may also have heard of some horror stories of the early adopters of cloud ERP. Now let’s not cloud the issues and let us separate the reality from the hype. Speed - Dial up access to the internet is not enough. It takes cable, DSL, or business class high-speed internet access to make web-based ERP work at acceptable levels of performance. If you have dial-up access, don't even bother. Reliability - Web-based accounting relies 100% on the internet being up and running and available. I can assure you, the internet is not always up and running and available. Ask yourself, how many times has your internet access been down this year? If the internet is down - you are down, and most likely your business is down as well. Who can blame a CFO for being reluctant to go through it all over again — even if the ERP that’s currently in place is cumbersome to customize, update, and maintain? Companies still running on-premise ERP software have some difficult choices ahead. The most difficult of those being deciding whether to stay with their on-premise investment or making the choice to keep up with current technology and migrate to a brand new system. The good news is that, Sage 300 (Accpac) which has been around for decades have kept pace with the current technology and emergence of Hybrid cloud, HTML 5, etc, moving to a new ERP solution doesn’t have to be the high-risk proposition it once was. If you’re dead-set on using an on-premise solution, you still have that option when using Sage 300 as your ERP. But you also have the option to access your Sage 300 system from the cloud as well. The main difference from the standard Sage 300 product is that Sage 300c features a totally new and modern Web user interface along with unique screen and desktop personalization options. The new interface is also designed around mobile technology so you get a more modern Sage 300 experience across multiple devices from your desktop or laptop to your mobile phone or tablet. Sage 300 2017 - A hybrid cloud approach enables the best of both worlds, delivering cloud-like flexibility, with the confidence of on-site hardware. The low cost of entry and flexibility of the cloud paired with the stability and comfort of on-premises hardware make this a very attractive model for many businesses. Sage 300c 2017 – access via your browser anytime, anywhere and any devices. 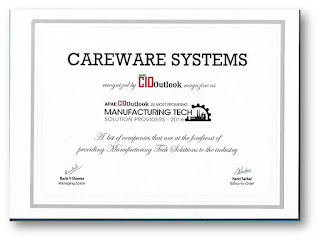 Careware Systems has been providing software and support to the manufacturing sector for more than 25 years. Over this time they have built up a deep understanding of the needs of all sizes and types of manufacturers. It is this cumulative experience and domain knowledge that has molded Careware into one of the Malaysia leading suppliers of manufacturing business management solutions. Today’s manufacturers face an array of challenges — everything from global market volatility to rapidly changing consumer demands. SME in particular face new challenges in today globalization of market. Evolving a manufacturing company to a new level of growth is more challenging than ever. However, these challenges are dwarfed by the exciting opportunities available to manufacturers that embrace digital business transformation — and leverage modern ERP software for its competitive advantage. Sage 300 ERP is a comprehensive system, covering finance, distribution, manufacturing, supply chain management, services, customer relationship management and business intelligence. The Sage 300 manufacturing modules comprises Manufacturing Order, Production Planning, Shop Floor Control, Lot Traceability, Manufacturing Bar Code & others. In short, when you choose Sage 300 ERP, you are able to face the future with confidence. Tel: (03 2714 3855) or by emailing to : sales@careware.com.my. 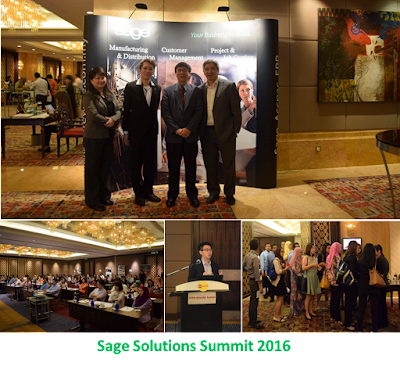 Sage Asia Honours Partners for Top Performance and Excellence with 2016 Partner of the Year winner. Petaling Jaya, — October 19, 2016 — Sage Asia on Wednesday, 19th October held the Sage Partner Executive Summit Asia at the One World Hotel, Petaling Jaya. At the summit Sage launched the Platinum Partners Scheme which recognises and rewards the elite Sage Business Partners that provide outstanding sale performance and customer service and adopt a fully collaborative approach to joint business planning. Yaj Malik, Executive Vice President & Managing Director Asia. Congratulations to Careware management and staff on this tremendous achievement. 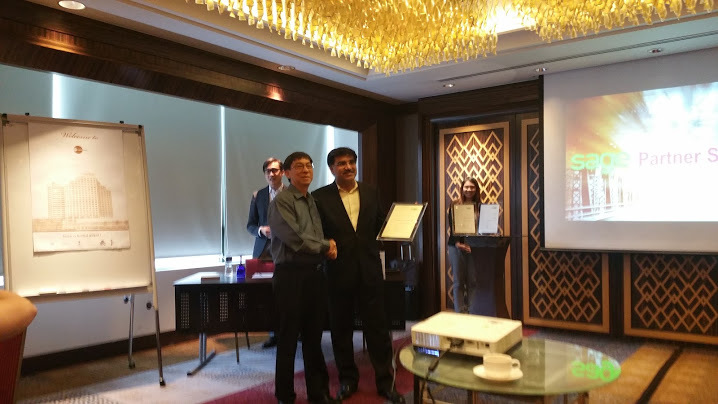 Through its partnership with Sage, Careware Systems helps small and mid-size companies in Malaysia reach productivity levels at the top of their respective industries. Careware represents the full range of Sage business management software including Sage 300 ERP, Sage 300 Project, and Sage 300 Manufacturing. For companies interested in growth, profitability and superior software support, Careware is the Sage business partner for you. For more information, please visit our website: http://www.careware.com.my/. Is Sage 300 a true ERP? Many have said this to me, during my course of meeting with prospect with my sales team. “Sage 300 only is only strong in accounting formerly Accpac. This should tell you something”. They learned the FUD (Fear, Uncertainty & Doubt tactics) from the competitors. 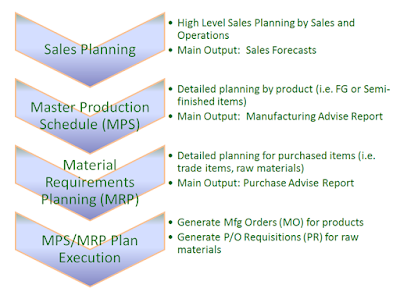 While it is correct that Sage 300 started out as Accpac a financially oriented product (and is still strong there), ERP does not mean exclusively manufacturing, although manufacturing is certainly part of it. Enterprise resource planning is an integrated software solution used to manage a company’s resources. 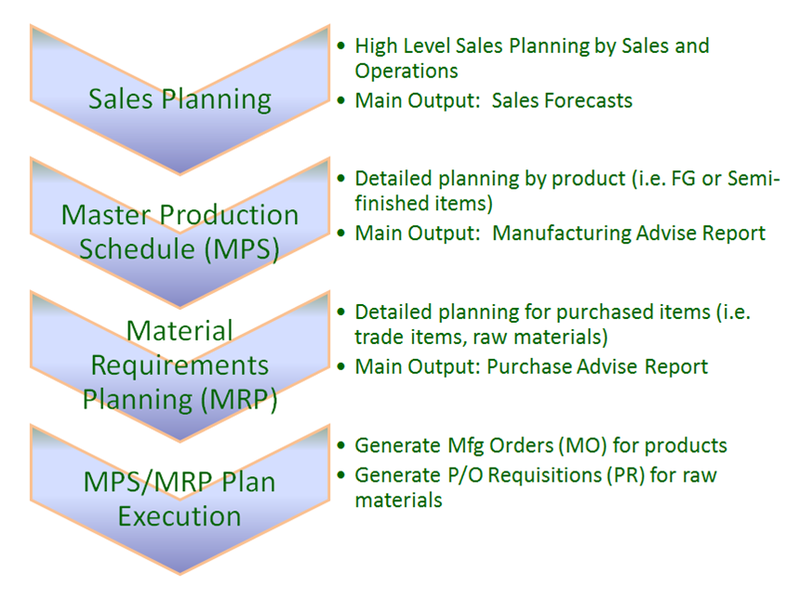 ERP’s was preceded by MRP 1 & 2 (material requirements planning). These earlier systems had limitations addressed by a fully integrated ERP system. Today, Sage 300 ERP systems integrates, inventory, purchasing, engineering, project, distribution, customer relationship, planning, manufacturing and accounting. 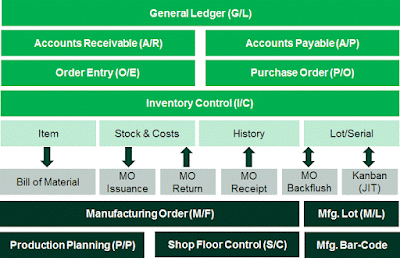 Sage 300 is very strong if you need complex, manufacturing accounting. After all what you do at the shop floor will impact your manufacturing accounting. I am not an accountant, my background is more engineering based, but have the view that an integrated ERP system will be able to have the following. Manufacturing a/c will show Manufacturing cost or Production Cost which will consist of Raw material consumption, direct labor & overhead. In accounting services, P&L will show Revenue less all Cos & Expenses, Cost of Goods Sold should equal to all direct operating cost. 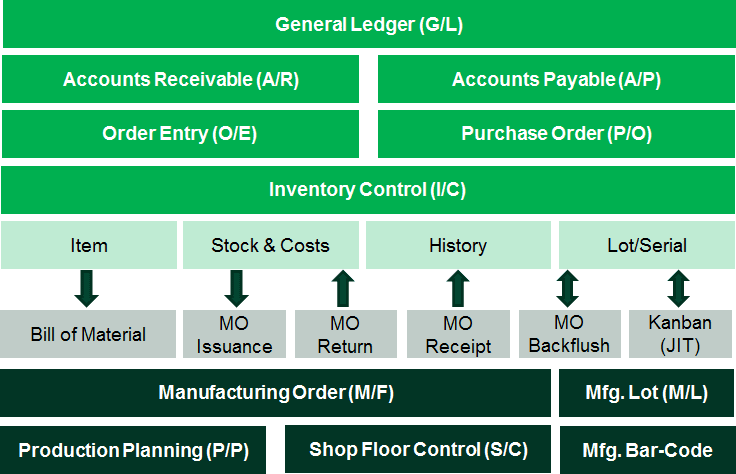 Sage 300 ERP is a product that has a solid foundation on which the manufacturing modules are built upon. In the market space that I compete in my competitor’s presale usually sell on price cutting. Having seen and evaluated our competitors’ product I do think they are a good enough manufacturing system, but fortunately for us their consultants are newbie’s and seems to be repeating on how great their technology is. Rather than how good their project or manufacturing functionalities will help the end-users and shows a full cycle demo with integration up to financial reporting on manufacturing accounting. So it comes down to supports and implementation and domain experience. I have seen a numbers of ERP implementations fail. If they are as good as they claim they why would they be selling on price? The puzzle doesn’t fit here. Good product, Good after sales support, Good consultancy but cheap price- go figure. 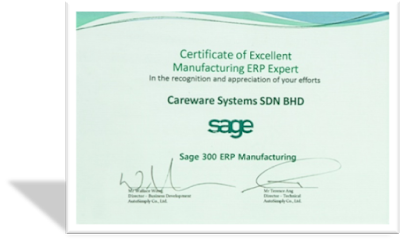 To learn all about Sage 300 Manufacturing Solution, contact CAREWARE Manufacturing Account Manager today by calling (03 2714 3855) or by emailing sales@careware.com.my. There are multiple licensing options; one is sure to be a perfect fit for your company. Mascots are representations of groups and organizations such as schools, sports teams and corporations. Typical examples of mascots include people, animals or objects that embody a desired character trait or symbolize the mascot's organization and purpose. Malaysia has used various animals as mascot such as Orangutan, (KL commonwealth Games) Mouse deer (Sukma game) to Turtle. (Monsoon cup) And off course all of us can remember the famous DiGi slightly overweight man in yellow spandex suit that epitomized DiGi liveliness and couldn’t care-less youth culture. Mascots generally symbolize something relevant to the country (where games are held) or company in connection with company concept and ideal. The recent RIO Olympic has Vinicius as the game's mascot, a mixture of all the Brazilian animals out of the expression of joy when Brazil was selected to host the 2016 Olympic and Tom a magical creature, a fusion of all the plants in the Brazilian forest out of the explosion of happiness when we found out that the Paralympic Games were coming to Rio. A person, animal, or object believed to bring good luck, especially one kept as the symbol of an organization such as a sports team. While Careware do not actually believe in lady-luck (see articles here) but, we have decided to adopt a Golden Retriever as our official Mascot. Golden Retriever was chosen as Careware mascot as it portray the friendly & caring personality of the company, strong and proud and yet gentle and humble. A Picture of Sky Smiling after a bath. He is a handsome dog. UMW Equipment upgrades its Sage Accpac ERP to the latest version of Sage 300 v. 2016. IIn the year 2011 UMW Equipment (a wholly-owned subsidiary of UMW Group), the regional’s distributor of Toyota Forklift and industrial equipment, selected Careware Systems to implemented Sage Accpac ERP with Service Manage from Technisoft. The entire Total Service Maintenance ERP Solutions went live in record time of 4 months, computerizing it entire Sales-Service-Spares operations & fully integrated to back office Financial Accounting. This is despite the fact of its unique operational challenges of multi-locations, Multi-product mixed, multi-currency & multi-lingual requirements. This is truly a great accomplishment for Careware Project team & UMW Equipment team. UMW Equipment has been using the system for five (5) years and in August 2016 decided to embarked on an upgrading exercises on their ERP systems to the latest Sage 300 2016 to enjoy the benefits of enhancement toward the software. This is In line with the growth projection and in improving operational efficiency, productivity and streamlining the technology processes to accommodate future growth. The upgrading exercise was carried out successfully without any problems due to diligent preparation and Carware Systems experience technical team. The Sage 300 Service Maintenance Suite by Technisoft is by far one of the most comprehensive ERP solutions available for Service Maintenance Business in the market. The Sage 300 ERP will continue to serve UMW for many years to come. This is truly a testament of how Sage protects your ERP investment. -------------------------------------------------------------------------------------About CareWare Systems : Through its partnership with Sage, CareWare Systems helps small and mid-size companies in Malaysia reach productivity levels at the top of their respective industries. CareWare represents a variety of business management software including Sage ERP, Sage CRM, and Technisoft Service Manager Software. For companies interested in growth, profitability and superior software support, CareWare is the Sage business partner for you. For more information, please visit our website: http://www.careware.com.my/. APAC 25 Most Promising Manufacturing Technology Solution Providers by CIO outlook Magazine. 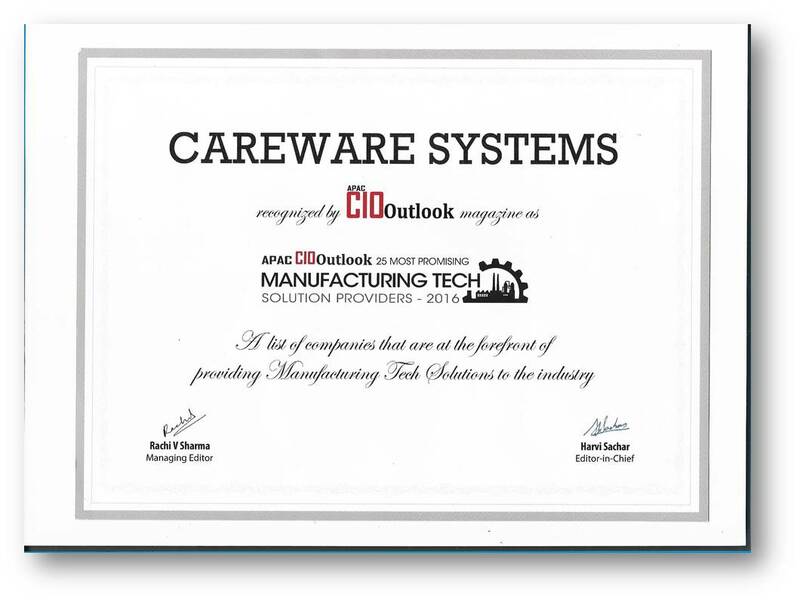 Thank you to all our valued customers, due to your support Careware has been chosen as the - APAC 25 Most Promising Manufacturing Technology Solution Providers by CIO outlook Magazine. Careware Systems is the Premier Partner of Sage and specializes in Sage 300 ERP. Focusing in the Sage 300 Manufacturing, Sage 300 Distribution and Sage 300 Project.